Want to add efficiency to your lab and get more comprehensive results? 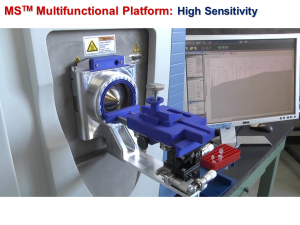 The Ionique automated multi-ionization platform is unique providing multiple ionization methods in a lightweight unit allowing ready replacement of the commercial ion source in minutes. No need for a dedicated mass spectrometer. Software provides templates for close alignment and a simple intuitive fine alignment protocol so that setup is fast and easy. Selection of electrospray ionization (ESI), matrix-assisted ionization (MAI), and solvent-assisted ionization (SAI) is by a mouse click. Because sample is delivered to the ionization region using a metal capillary which is washed between acquisitions, no expensive consumables are necessary. ESI and SAI only use washing solutions, and MAI requires in addition a matrix solution. Sampling from 96 and 384 well plates as well as vials and Eppendorf tubes is available. Typically 1 microliter of solution is sprayed in ESI achieving sensitivity comparable to commercial ESI sources. For SAI and MAI only 0.1 – 0.2 microliters of analyte solution is used. ESI, MAI, and SAI have all been shown to have different ionization efficiencies for various compounds so that the combination of methods give a more complete analysis, especially for complex mixtures encountered with biological samples. 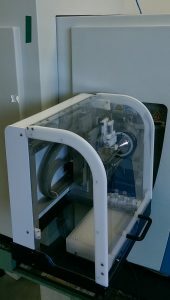 The Ionique manual platform replaces the commercial ion source in seconds so that switching between the manual platform and the commercial source is fast and easy. The Ionique Manual platform has capabilities of ESI, nESI (optional), MAI, SAI, and (voltage) vSAI. Switching between ionization methods is also fast and simple. ESI, nESI, SAI and vSAI interface with an infusion pump or an LC with optimum flow rates between 4 – 50 microliters/minute. MAI offers sensitivity comparable to nESI but faster, easier, and more robust. This is a valuable and low-cost addition to any laboratory with interest in obtaining the most comprehensive analyses possible, or simply needing improved sensitivity. ASAP-MS is a popular low-cost manual ionization method used worldwide in hundreds of laboratories. Vaporizable compounds are ionized with ease and simplicity. The approach is frequently used for direct analysis of biological and polymeric materials as well as synthesis products. 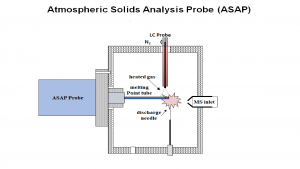 An advantage of the ASAP method is that a simple modification of most commercial ionization sources allows the ASAP method to always be available while not interfering with normal use. The ASAP method requires high voltage used with ESI or APCI, a discharge needle, and a stream of heated gas (usually nitrogen) supplied with APCI and many ESI sources to vaporize the sample. Numerous publications extol the virtues of the ASAP method. For a list of interesting ASAP publications visit ASAP-MS.COM.